Two years ago, we went on our first date married with the now McGrath's. 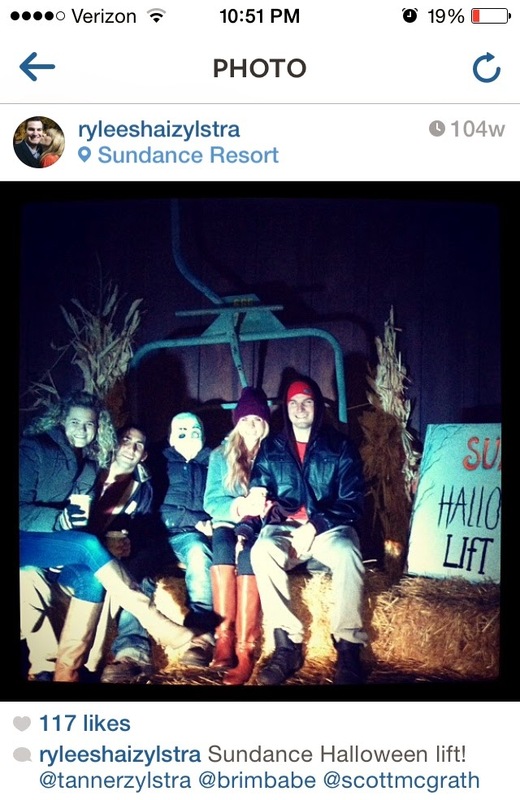 We attended the Halloween Lift Ride up at Sundance, and we had a blast listening to the new T Swift album, and snacking on Pumpkin Bars. This year, in honor of Taylor, we decided to do the exact same thing. They've sure amped it up this year, it was so fun! When you first walk to the Ski lift, there's corn hole, and some pumpkin bowling, so of course the boys had to participate! We reenacted our photo from those two years ago, except this year, that scarecrow was fake. We punched him to make sure, because last time I was sitting on a mans lap and had no idea!! If you're looking for a fun fall activity, take the Sundance lift! The Halloween edition will be over soon, but it's such a fun evening out all bundled up. We had a good time with our friends, reminiscing on the olden days! But, we think these days are even better!